The Model 620 Fiber Optic Measurement System (FOMS) supports RJC Fiber Optic Temperature sensors. 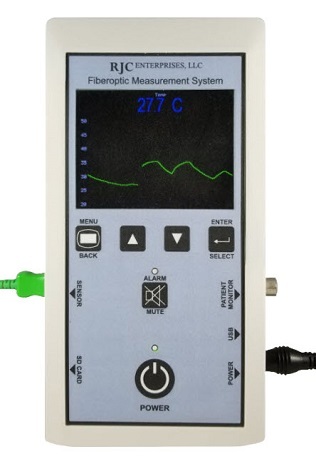 This FOMS is a demonstration/evaluation system designed to highlight user features that customers may want to incorporate into their respective medical devices. It is not approved for clinical applications. This FOMS contains an optoelectronic circuit board assembly, a graphic color LCD display, an SD card receptacle, alarm functions, and other related features. © 2018 RJC Enterprises, LLC. All Rights Reserved.